I hope this finds you all well. I know many of us are exhausted from our own recovery efforts from Irma. Francine, Glen and I met with Steve Houseknecht Friday the 23rd of September to assess the damage to the Fakahatchee from Hurricane Irma and any needs from FOF. Power had just been returned to the park office. Until then the park staff, like many of us, had been in a survival mode. All the staff had evacuated, with a large contingent weathering the storm at Mike Duey’s house in Golden Gate. Remains of the chemical shed and shade house by the park office. All the park buildings came out pretty much unscathed except for the small chemical shed behind the park office and Glen’s shade house which were demolished. However, the park residences did not fare as well. Steve Houseknecht’s home by the lake flooded, albeit by only a few inches, but with sufficient damage that it’s uninhabitable. He has spent much of the past week ferrying personal possessions to his Everglades City house. On top of this, his truck broke down so he commandeered the FOF truck with our blessings. Then he was almost arrested when he was stopped in unkept civilian clothes driving our truck piled high with furniture. They thought he had stolen it. 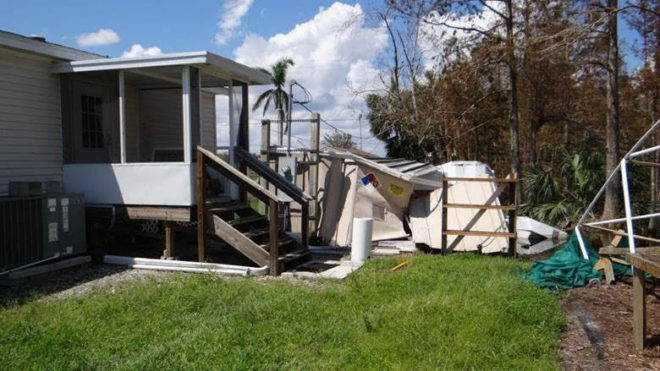 Steve’s Everglades City home is a partial stilt house on a raised mound. The water level came within a foot but didn’t enter. 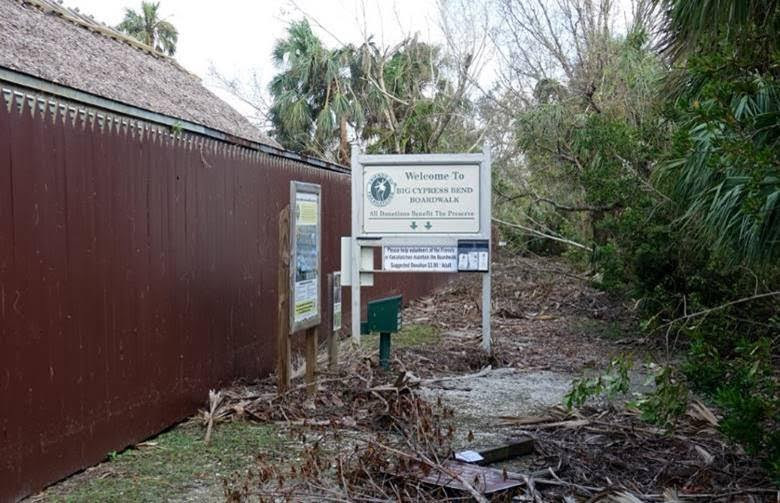 Everglades City has been devastated. After our park visit Francine and I looked in on Marya Repko. She had mud and water on her screen porch but her living area escaped. It was tragic to see piles of household debris lining all the streets. Mike Owen’s house has some roof damage and the stilt house up by I-75 occupied by our newest park Ranger, Guy DiGiovanni, remarkably was not lifted off its foundation, but had some damage. 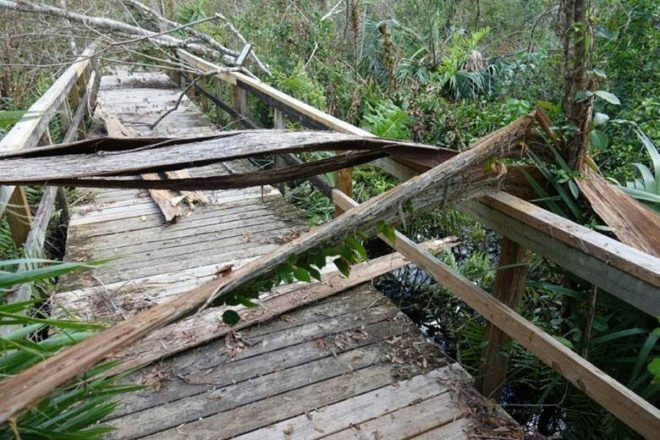 The Park Service will pay for the necessary repairs. The entire length of Janes Scenic Drive is still flooded. Steve was able to make one foray as far as Gate 7 after which it was impassable. At its worst, water was flowing across SR 29 and Highway 41 in places. I’m sure we can expect a number of wash-outs on our trail network, although Steve doesn’t expect the road bed of JSD to be too badly damaged, as he had wisely closed much of it since the flooding started 6 weeks ago. Steve is thankful that all the park and FOF vehicles were okay and had been protected either in the sheds or the Harmon building. Our entrance sign and donation box still stand at the boardwalk entrance. 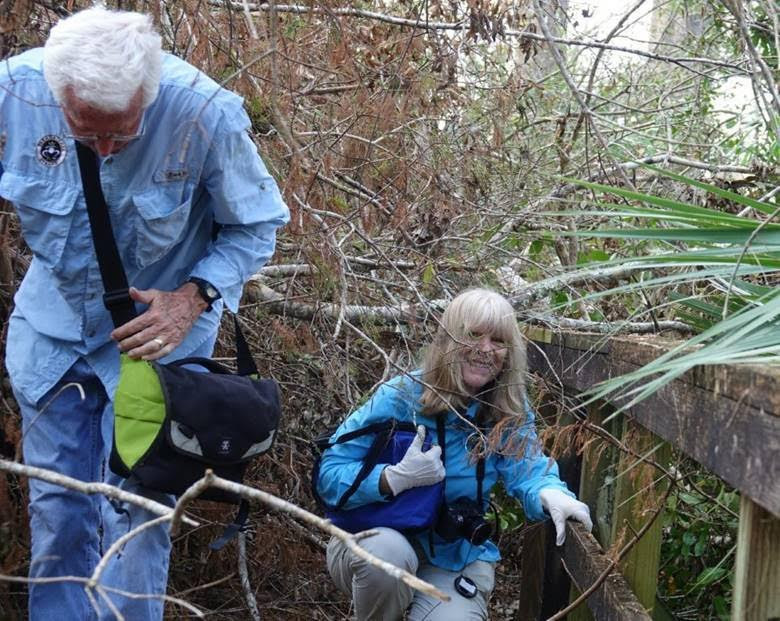 On the way to the park, Francine, Glen and I surveyed the damage to the Big Cypress Bend Boardwalk. Until then park staff hadn’t the resources or time to make other than a cursory inspection. On the crushed rock approach to the start of the Boardwalk our cabbage palms had all their boots stripped so they looked like they had been neatly trimmed by some urban landscaping firm. The vista had also been decidedly opened up with more sunlight where there had been shade. 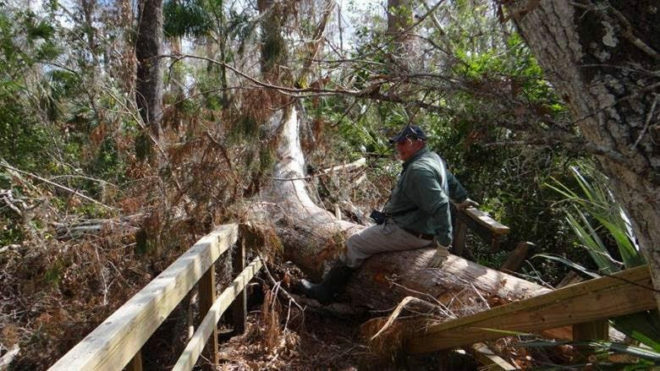 This downed tree is one of several blocking the boardwalk. Our new signage along the entire length of the Boardwalk seems to have fared well. Even our big old FOF donation appeal sign was still standing. The traditional chickee structures in the Indian village and almost everywhere else along our route to the park fared well – an important observation as we are building a chickee rain shelter/ outdoor classroom at the Boardwalk this autumn. Although mosquitoes in urban areas are becoming a problem, at the park they are not. Explorers Glen Stacell and Francine Stevens scuttle under another branch. We managed to reach the alligator hole after about an hour of struggling, some of which was on our hands and knees. 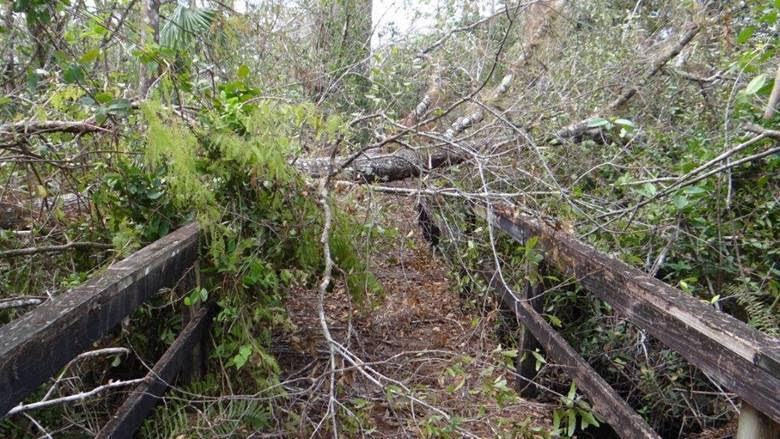 Although it is a mess, the Boardwalk fared remarkably well. Most of what needs to be done is cosmetic, such as debris clearance. There were only 10 places with noticeable physical damage to the structure, largely the railings. Damage from the root ball of a tree that fell away from the boardwalk. However there is one 8 foot section where a large tree fell away from the boardwalk. Its root ball canted the boardwalk surface at a 45 degree angle. A bypass may be needed here as it will be very difficult to remove the root ball. There is another section higher up where a heritage tree has fallen across the boardwalk and very heavy duty chain saws will be needed. Cypress bark stripped by the wind from trees. The platform at the alligator hole was intact and just needs cleaning up. 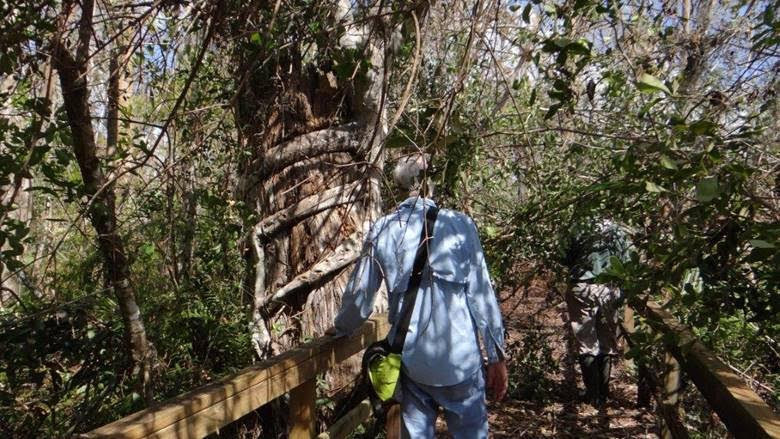 Unfortunately some of our heritage trees below the big cypress tree cutout had their bark stripped by the wind and will not recover, but from the big cypress tree cutout (including those trees) the bark is pretty much intact and the heritage trees from that point onwards should recover. Unfortunately our iconic eagle nest was blown away, although the tree is still intact. 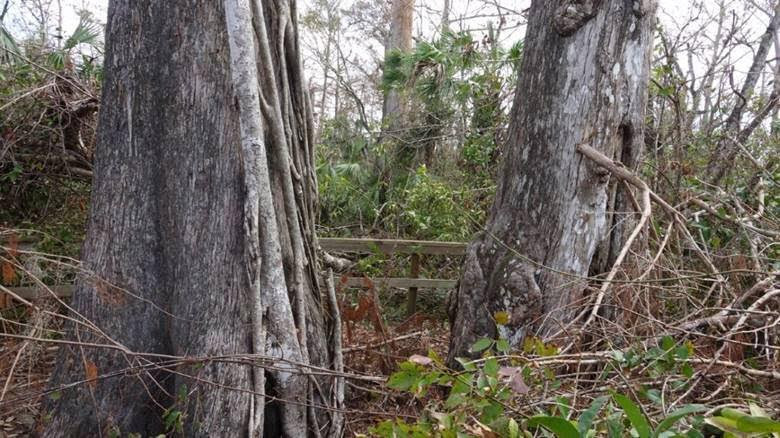 We will have to consult with the Park Biologist as to whether we should interfere and attempt to put some sort of platform there, or let nature take its course. The big cypress tree cutout is intact. Amazingly I saw a number of the orchids we had planted out last year with Kit Kitchen-Moran still in place and some stripped cypress already coming out in bud. Unfortunately we also saw some Brazilian pepper reacting to the stress by rushing to flower. Berries and seeds will soon follow. A resilient Dingy Star orchid thrives near the end of the walk. 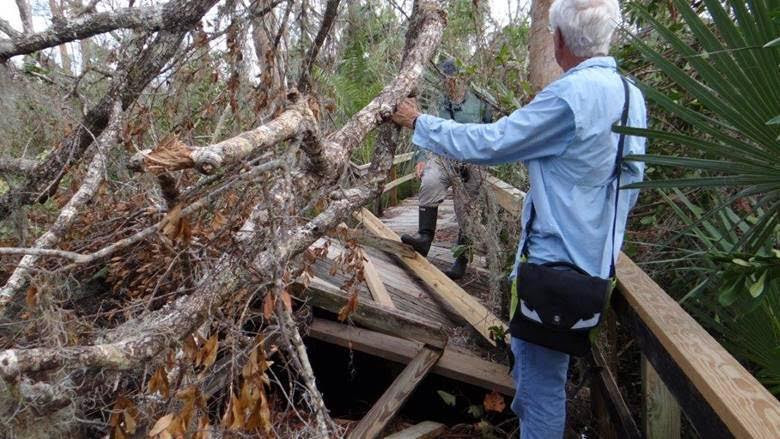 The State has authorized Steve to hire a contractor to clear the boardwalk. 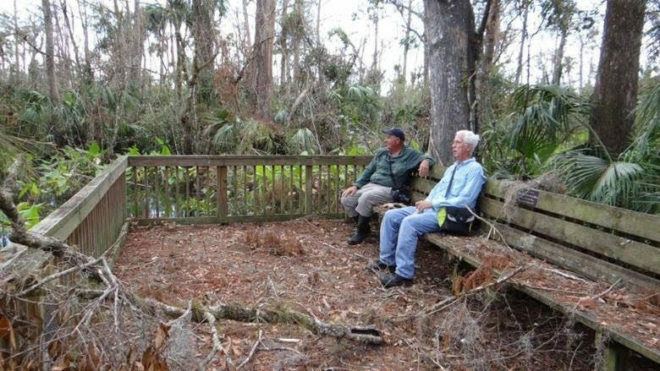 We first need to get some volunteers in first to try to recover the hundreds of healthy bromeliads littering the boardwalk. 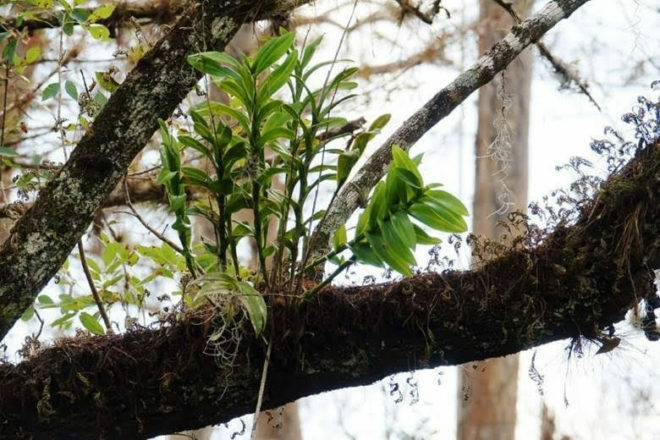 These can be saved and replanted along our future epiphyte walk. We also want to make good use of the wood chipper we donated to the park so that the debris is hauled out and not just thrown over the rails which would spoil the future visitor experience. The East River canoe trail entrance was completely blocked by downed trees and the port-a-potty there half submerged, but it is already partially opened through some self-help by eager canoeists. Until the water goes down there is not much we can do along our trail network and JSD. Steve is assessing the situation and will be making a call for FOF volunteers to assist when appropriate. The iconic strangler fig tree still stands. Our remarkable resource has suffered far more insult than Irma in the past–including strip logging– and will recover, aided by our dedicated park staff and volunteers. Phew. We made it. Are we too old for this?